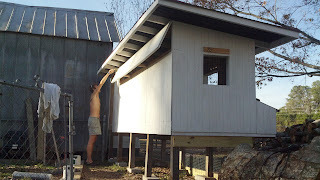 The Boy has spent quite some time during his holiday time off working on the new massive chicken house. It was started earlier this summer but the hurricane put a hold on the whole project and we are just now getting back to it. Tomorrow he hopes to get the window shutters installed (that open and close as needed for ventilation, heat and cooling), dividers put in the 14 nesting boxes, the chicken door made and installed, and the storage room door put on. All said and done, the house should comfortably hold at least 40 chickens which gives us lots of room for flock expansion (slowly) in the future. We hope to have the flock moved in this upcoming week and out of their temporary pens (aka the FEMA trailers) they've been living in since the hurricane. And yes, it is nearing the end of November and it was over 70 degrees here today... hence the shirtless boy in shorts.